Test Data: BF- .89 LE 8.1 at 288 lbs. This guy is designed to make Yorkshire hogs better. We call him "The Grind", Chuck and Ben just keep grinding out better Yorkshires every year. This guys litter mate brother was the Reserve Champion Yorkshire boar at the 2017 World Pork Expo. This was our pick of the Yorkshire boars. He is long bodied, heavy boned, big ribbed, and level topped. His feet are big and his pastern strength is right. He is a tall fronted, extra big legged hog that is extremely athletic. If you follow this guy around the yard, he is as square and true off of his hip and hind leg as he is through his chest and fore rib. He has a very long stride and the ability to get his rear leg way behind him. Love his big thick feet and wide spread toes. The Grind has a very high head carriage, his head and jaw is long and square and his neck is long and clean. This guy does not look like a sissy, he looks like a breeding hog designed and bred to make hogs taller fronted, long necked, heavy structured and super athletic. 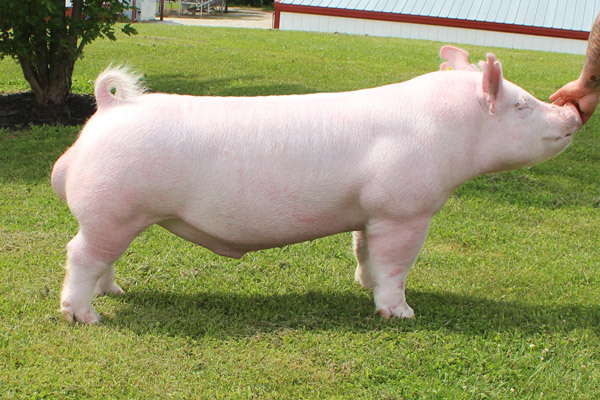 Chuck told us his dam is a super fancy show gilt that farrows with ease and flat milks. Thanks guys!